I've been doing the chore that's more tedious than making making cordage, and that's adding content to Eulorum. Diana's index is helpful, but there really should exist a more detailed account of the things in Eulora. The thing that really got me going was the thought that item details might change over time, and we'd have no record of what they used to be -- particularily the cute item descriptions. In the process, I had to learn where the item images are located so that I could upload them. It turns out, they are all in Eulora/art/materials.zip -- well, all except indescript_gemstone_dust.png. As you can see by following the preceding link, I made a few attemptsi at creating my own placeholder image. But how to get it to show up in the game? Should be easy enough. Add the new image to materials.zip and restart the client. And while this is indeed how to update a preexisting image, it doesn't work for images that didn't exist in the first place. Here's how to do it. Let's say you want to add my sparkly new gemstone dust icon to your own client. First you need to let the game know to look for the file. This information is hiding in a file named imagelist.xml which is itself tucked away in Eulora/art/skins/base/client_base.zip. One command later and you're ready to make the addition. Open up that xml file in your favorite text editor, and find a place where other icons are listed. Copy any of them onto another line, and change it to the following. Save it. And zip it back into the archive. Ok now the game client will know where to find the icon. We just need to put the icon there. I assume you got your hands on a copy of one, either from my link above, or perhaps your own creation. The steps from this point forward will work to modify any existing icon in the game, and you are encouraged to do just that! Make sure the image has the correct file name, and add it to the materials zip archive. If you haven't already, close your client. 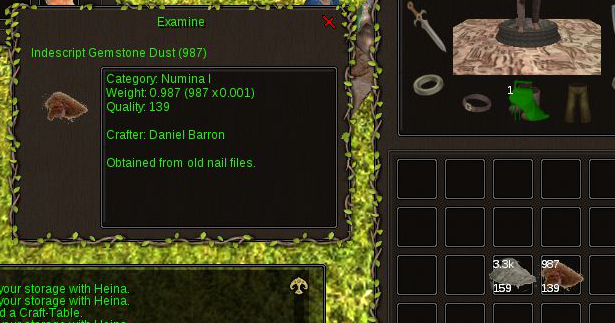 When you open it again, the updated image should now be visible wherever your dust may be! And there are no more steps. It's really that simple.